The universe consists of objects having various qualities and standing in various relations. –Alfred North Whitehead and Bertrand Russell, Principia Mathematica (1911-13). Derek Zoolander: Why do you hate models, Matilda? Matilda: I think they’re vain, stupid, and incredibly self-centered. Hansel: I totally agree with you. But how do you feel about male models? Models are hot right now in metadata circles. To create a linked web of data we need unambiguous metadata. We have to be clear about the things we’re describing and what we’re saying about them. Because metadata must now, above all, be machine-readable, and computers don’t handle ambiguity as well as we do. They don’t have our ability to make best guesses based on context and past experience. As I read recently in a Boston Globe article, a four-year old child can quickly fill in the blank in the sentence “The giraffe had a very long __” but a computer will struggle. Models help us put things in terms even a computer can understand. Metadata modelling is not new. Aristotle presented not one but two models of the world in his Categories. Unfortunately, as often with Aristotle, it’s not easy to work out exactly what he is saying, but his categories of ‘things that are said’ are: (1) substance; (2) quantity; (3) quality; (4) relatives; (5) somewhere; (6) sometime; (7) being in a position; (8) having; (9) acting; and (10) being acted upon. These modern models are much like the logical atomism of early 20th century philosophers, Russell, Whitehead and Wittgenstein. 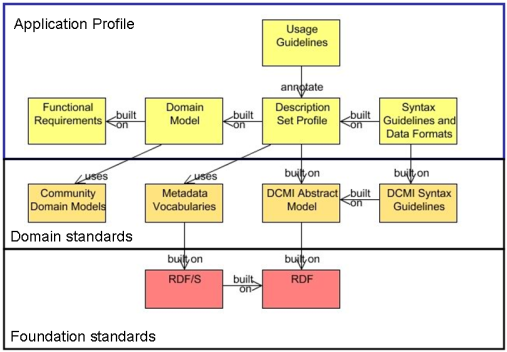 Once the foundation model is established, we can build domain models on top to model particular parts of the universe, eg educational resources in the case of DC-Education, bibliographic resources in the case of FRBR. The Dublin Core Singapore Framework describes how this all works. So not all models are vain, stupid and self-centred. And there is a lot more to life than being really, really, ridiculously good-looking. Metadata acronyms – MLR or LRMI? Opinions expressed in this blog are not necessarily those of the NSW Department of Education and Communities nor TAFE NSW.